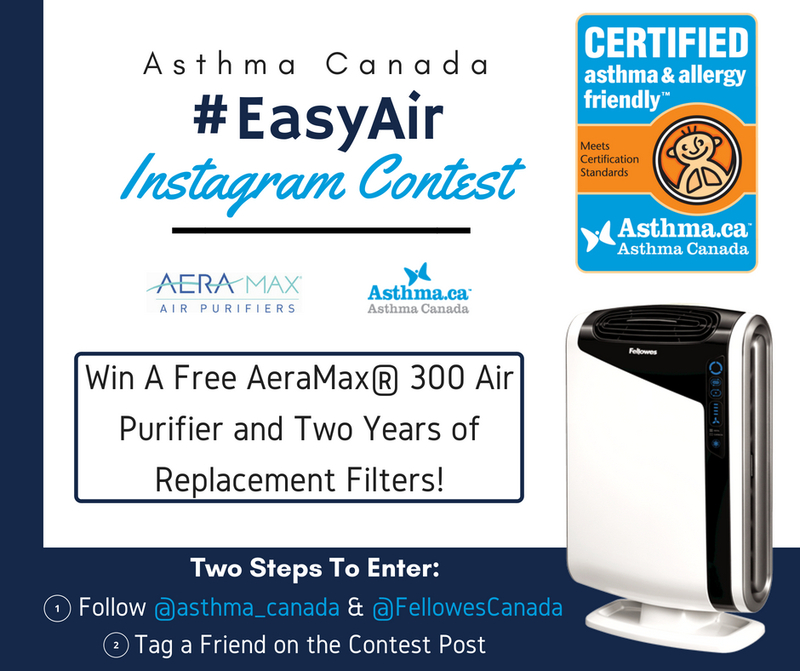 Asthma Canada and Fellowes Canada are holding an Instagram giveaway contest where you have the chance to win one (1) AeraMax® 300 Air Purifier with two (2) years of replacement filters (eight (8) carbon and two (2) True HEPA). The contest winner will be randomly selected from the comments section of the contest post the day after the contest ends (October 10th, 2018) and announced once we have contacted the winner and confirmed details for the shipping of the prize. Asthma Canada will contact the winner through direct messaging on Instagram, then through email. The winner will then have one week to respond before a new winner is randomly selected. Once a winner has been selected, contacted and provided their shipping details, Fellowes Canada will ship the prize directly to the winner. Please allow up to four weeks for delivery. #EasyAir Instagram Contest – Win one (1) AeraMax® 300 Air Purifier with two (2) years of replacement filters (eight (8) carbon and two (2) True HEPA). 1. NO PURCHASE NECESSARY. Void where prohibited. By entering this contest the entrants and participants automatically agree to accept and abide by these Terms & Conditions. All decisions of Asthma Canada with respect to any aspect of this Contest, including without limitation the eligibility of entries, are final and binding on all entrants, in all matters as they relate to the contest. 2. 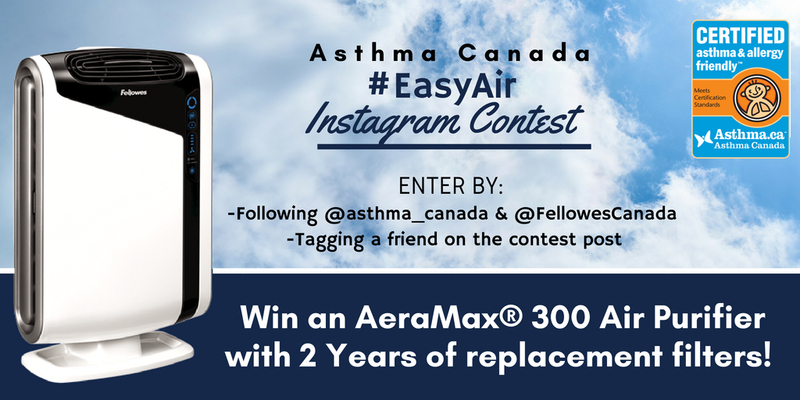 How to enter: (1) Follow Asthma Canada on Instagram @asthma_canada (2) Follow Fellowes Canada on Instagram @FellowesCanada (3) Tag one friend (who would be interested) on the #EasyAir Instagram Contest Post. 3. Eligibility: This contest is open to all residents of Canada, with the exception of residents of Quebec, who are over the age of majority in their province or territory of residence at the time of entry. This contest is void wherever prohibited or restricted by law and is subject to all federal, provincial, and local laws and regulations. Employees of Asthma Canada and their household members (whether related to the employee or not) are not eligible to participate in the Contest. 4. Prize: One (1) AeraMax® 300 Air Purifier with two (2) years of replacement filters (eight (8) carbon and two (2) True HEPA). Prizes must be accepted as awarded and are not transferable or convertible to cash. No substitutions will be accepted. Shipped prizes shall not be insured and neither Asthma Canada nor Fellowes Canada assume any liability for lost, damaged or misdirected prizes. 5. Expiration and Draw: The contest will run from October 2, 2018 until October 9, 2018 at 11:59 EST. On or about October 10, 2018, in Toronto, Ontario, Asthma Canada will select one (1) winner by random from all eligible entries. The winner will be randomly selected from the comments section of the contest post located on Instagram, through the random selection of a number, the person who made the comment that matches the randomly selected number will be the winner (provided that they have met the criteria of eligibility outlined in the Terms & Conditions). The chances of being selected depend on the number of eligible entries. 6. Notification/Delivery: The entrant selected as the winner will be notified via direct message through Instagram with instructions on how to contact Asthma Canada through email by October 15, 2018. The contacted entrant must respond within one (1) week of notification and meet all of the contest criteria and conditions. Upon notification, the selected entrant must respond by e-mail to the contact address provided in the notification. If the selected entrant fails to respond to the notification within the allotted time, a new winner will be randomly selected from the remaining entries. Asthma Canada is not responsible for the failure for any reason whatsoever of a selected entrant to receive notification or for Asthma Canada to receive a selected entrant’s response. The prize will be shipped directly to the contest winner by Fellowes Canada within four (4) weeks from the date of notification and confirmation of shipping details. 7. Privacy/Use of Personal Information: By participating in the Contest, the entrant 1) grants Asthma Canada the right to use the entrants name and contact information for the purposes of administering the Contest, including but not limited to contacting and announcing the winner; 2) grants Asthma Canada the right to use the entrants name for publicity and promotional purposes relating to the Contest and the announcement of the winner, on any platform and 3) acknowledges that Asthma Canada may disclose the winner’s personal information with Fellowes Canada, for the purposes of promotion and delivery of the prize. 8. Conditions: Asthma Canada assumes no responsibility for lost, late or misdirected entries or any software, hardware, network, or other failures or malfunctions that interfere with the proper conduct of the contest. In order to win, the entrant must first have complied with the Contest rules of entry and terms & conditions. All winners consent to provide their name, address and contact information for shipping purposes. By participating in this contest, each participant agrees to release Asthma Canada and Fellowes Canada from any and all losses, damages, rights, claims and actions of any kind in connection with the contest or resulting from acceptance, possession, or use of any prize, including without limitation, personal injury, death, and property damage, and claims based on publicity rights, defamation or invasion of property. 9. Limitation of Liability: By participating in this Contest, each participant agrees to release Asthma Canada and Fellowes Canada from any responsibility or liability for lost, late, unintelligible/illegible, falsified, damaged, misdirected or incomplete entries, notifications, responses, replies, or for any technical malfunctions that may occur. Asthma Canada is not responsible for any incorrect or inaccurate information, whether caused by technical error or human error, which may occur in the administration of the Contest. Asthma Canada is not responsible for any injury or damage to entrant or to any computer related to or resulting from participating or downloading materials in this Contest. Entrant assumes liability for injuries caused or claimed to be caused by participating in the Contest, or by the acceptance, possession, use of, or failure to receive, any prize. Asthma Canada and Fellowes Canada assume no responsibility or liability in the event that the Contest cannot be conducted as planned for any reason, including those reasons beyond the control of either organization, such as infection by computer virus, bugs, tampering, unauthorized intervention, fraud, technical failures, or corruption of the administration, security, fairness, integrity or proper conduct of this Contest, and/or the Contest content and website pages. 10. Termination: Asthma Canada reserves the right, in its sole discretion, to cancel, suspend, or terminate this Contest, in whole or in part, and/or modify, amend or suspend the Contest, and/or the Contest Rules in any way, at any time, for any reason without notice and without liability. AeraSmart™ Sensor monitors the air quality and automatically adjusts the fan speed to keep your air purified. Fan Speed Indicator lets you manually adjust the fan speed setting – low, medium, high or turbo. Ultra quiet operation. Filter Change Indicators let you know when it is time to replace your True HEPA or Carbon filter. Nearly one in four Canadians are affected by asthma and allergies. For these Canadians, being able to find products that they can trust as being safe from allergens and asthma triggers is key to living symptom-free. The asthma & allergy friendly™ Certification Program is administered by Asthma Canada in partnership with the international research organization, Allergy Standards Limited (ASL). It is an independent certification program created to identify, scientifically test and certify consumer products that are better suited for people with asthma and allergies. Only products that meet the highest standards are certified with the asthma & allergy friendly™ Certification Mark. Visit the asthma & allergy friendly™ Certification Program’s website to browse the complete list of certified products.